Not all of the artists who exhibited at the Armory Show went on to become household names. Agnes Pelton is just one of many who are now virtually forgotten. An innovative American landscape painter with an imaginative, spiritual approach to the natural world, Pelton was a pioneer of modernism who believed that painting was a form of visual poetry. 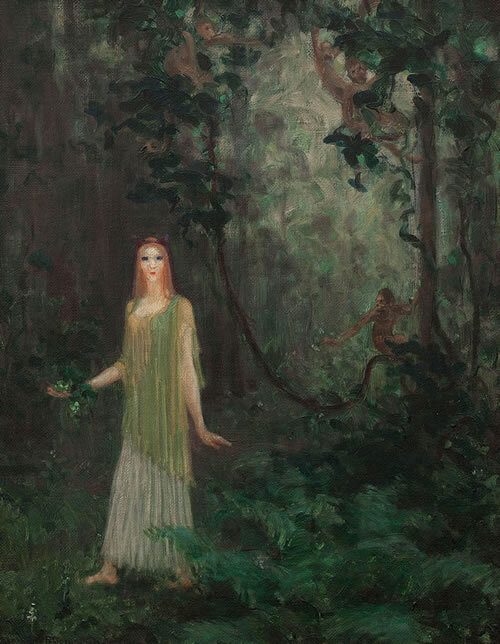 At the Armory Show Pelton exhibited two of her Imaginative paintings, a series of symbolist figure compositions in pastoral settings that she began in New York in May 1911. They were clearly inspired by the work of Arthur B. Davies, whose pastoral fantasies of people in harmony with nature entranced her. Photographs of her from this period show that she enjoyed dressing as a figure from an Arcadian world, wearing classical togas and flowing gowns with flowers in her hair. In the summer of 1912 Walt Kuhn, the executive secretary of the Association of American Painters and Sculptors, was impressed by an exhibition of Pelton’s work that he saw at Hamilton Easter Field’s studio at the art colony in Ogunquit, Maine. She became one of the handful of women whom Kuhn and his co-organizers invited to participate in the Armory Show. After her mother died in 1921, Pelton moved from New York to a historic windmill near Southampton, Long Island. In search of a more spiritual life and art, she started a series of nature-based abstractions—similar to her contemporary Georgia O’Keeffe’s paintings but imbued with metaphysical ideas —that represented a new direction for modern painting in the United States. When the windmill was sold by its owner in 1932, Pelton moved to Cathedral City, a small town outside of Palm Springs, California, where she spent the rest of her life. In 1938 she helped found the Transcendental Painting Group, which was committed to spiritual abstraction.